This railcar was built by Schweizerische Industriegesellschaft (SIG), Neuhausen and was fitted with a Sulzer 8LV21 (215 x 300 mm bore & stroke) 250hp at 550rpm coupled to a Brown Boveri electric transmission. (The railcar was numbered BFm 2/4, #791) Test runs began in February 1925 being noted on February 19th working a round trip from Wallisellen to Romanshorn, operating with a trailer, total weight being 76 tons. A week later the Hauenstein line was visited, on the upward gradient (27% above Olten) the railcar without trailer reached a speed of 27km/h. In working to Sissach with a trailer and on a gradient of 21% it reached 26km/h. It was later allocated to Brugg depot and handled the service to Wohlen, a daily mileage of 172 km. From May 1927 to 1932 it operated the Brugg - Wettingen - Otelfingen - Niederglatt route, a daily mileage of 206 km. Sometime after May 1932 it was noted stopped at Zurich with mechanical problems. In its last sphere of activity it had been replaced in May 1933 by the CFm 2/4 9921. During 1937 its original engine was replaced by a Sulzer two-stroke opposed piston model 4ZG14 of 400hp at 1,250rpm (possibly similar to a Junkers type - the pistons working the crankshaft by rods & levers) (Redesignated Cm2/4 #9901). By the spring of 1938 it was at Winterthur working the Koblenz - Winterthur - Etzwilen - Singen and Effretikon - Hinwil route. Between 1939 and 1945 the shortage of fuel oil led to it being stored. When supplies became available after 1945 it was allocated to Bellinzona depot, operating over the Luino line to Ranzo alongside FM 2/4 18601, with a daily mileage of 268 km. By 1946 it had become increasingly unreliable and was eventually taken out of service and stored. Photograph courtesy SBB-HW Zurich CFm 2/4 791 is seen at Zurich in 1951. Attempts to justify electrification of the Nyon - Crassier - Divonne line proved uneconomic, even the existing service provided by steam traction (mostly an Eb 3/5 or Ec 3/5 with a luggage wagon and a passenger vehicle) was losing money. It was thought that the stored CFm 2/4 9901 could better meet this route's modest requirements which led to its re-activation and for a third time it's was re-engined in 1951, now with a Saurer V12 300hp engine operating at 1,500 rpm, becoming CFm 2/4 791. Tested during December at Zurich & Berne it began service during February 1952 between Nyon and Divonne. The abolition of third class in 1956 saw it redesignated BFm 2/4 791 and then BFm 2/4 1691 in 1959. In July 1962 the power unit suffered damage, repairs were not forthcoming and the railcar languished out of service for three years at Biel & Delemont. In April 1965 the engine and transmission were removed, with the vehicle taken over by the maintenance of way department as a measuring and calibration car number X 91502 in 1966. In 1976 the vehicle was renumbered to Xa 30 85 97 30 100-8 and was finally retired in January 1989. C= third class, M=internal combustion, f= luggage compartment, with four axles two of which were powered. Another Sulzer publicity shot of 9901, presumably early on in its career. This luggage van was built by Schweizerische Industriegesellschaft, Neuhausen with a Maschinenfabrik Oerlikon electric transmission. It was powered by a Sulzer 6LV28 four stroke engine (280 x 360 mm bore & stroke) of 350hp at 520 rpm, or 420hp at 620rpm which was directly coupled to a Type 8B950 main generator and Type GE45 auxiliary generator. Main generator maximum voltage was 1020 volts, auxiliary generator normal voltage was 150 volts. Excitation of the main generator was provided by the auxiliary generator which was fitted with a compound winding for this purpose. Water from the engine was circulated and cooled through external roof mounted panels before returning to the engine compartment. The two self-ventilated Type EM520 traction motors, with gear ratio 1:4.12 were located on the bogie at the opposite end from the diesel engine compartment to assist in even weight distribution. A compressor supplied air for the brakes and for the engine's control systems. Trials were carried out with several trailers to a total weight of 130 tons. 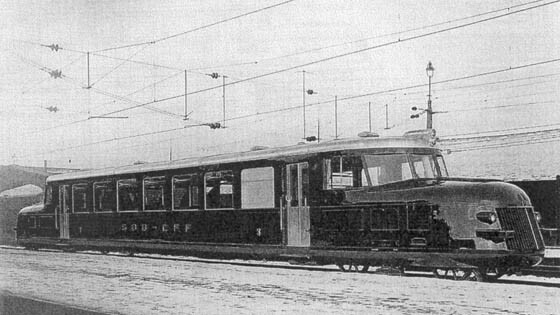 After delivery in the January 1930 the FM 2/4 18601 was allocated to Winterthur. Initially operation of the railcar was minimal, operating short distances to Etzweilen & Thalheim. By 1935 the railcar was working trips to Etzweilen and Singen. During 1936 it was re-engined with 6LDA28 turbocharged engine, 600 bhp, straight-six cylinders. It was now covering 600km daily on express workings over the Winterthur - Schaffhausen - Konstantz - Basel - Winterthur route, for much of 1938/39 its monthly mileage totalled 18,000km, a remarkable achievement. Unfortunately the start of World War Two in September 1939 put an end to this success, the shortage of fuel oil sidelining the diesel powered vehicles. Photograph courtesy ABB Fm 2/4 18601 on a test run near Etzwilen sometime during 1930. In 1945 the railcar returned to Bellinzona depot, being used on the Luino line. During May 1947 it was transferred to Winterthur depot and was reclassified Fm 2/4 891, being used on the Singen line. In the summer of 1957 the crankshaft broke, it was re-engined with an SLM V8, 8YD20TrT turbo charged engine, 720bhp at 1,200 rpm (200 x 240mm bore & stroke) similar to that used in the Em 3/3 shunter. It was again renumbered, this time to Fm 2/4 1692 at the end of 1961 and allocated to Geneva. It appears not to have been used too profitably here on the lines to Nyon and Divonne, so in May 1962 it returned to Winterthur covering the workings between Etwilen and Singen. It remained on these workings into May 1969 alternating with a Bm 4/4. Its usefulness declined - used from time to time in the Remisen of Wil or simply parked out of service at Etzwilen. Since its SLM V8 and generator group were identical to those fitted to Em 3/3 18801-18806, it was retired December 29th 1971 and surrendered its engine-generator set to the aforementioned locomotives. 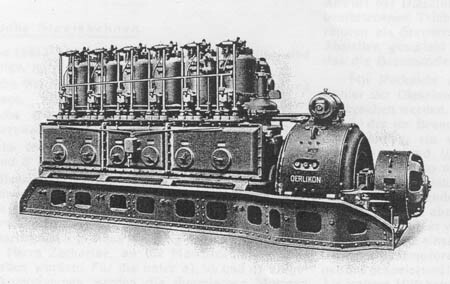 The diesel engine & generator group as originally installed in baggage car 18601. In March 1973 the engineless luggage van was later sold to the Emmental-Burgdorf-Thun Railway which used it in its emergency train, renumbering the vehicle to 1201. Known as Red Arrows these two stylish railcars were built by SLM and each equipped with a Sulzer six cylinder engine, 190mm bore by 230mm stroke, output 290hp at 1200rpm, transmission was of the SLM oil pressure operated mechanical gearbox type, reverse gear was operated pneumatically. Maximum speed for each of the forward gears was 28, 49, 70, 96 & 124 km/H. Both motor coaches were delivered during December 1935, initially undergoing extensive testing, including working over the Bellinzona - Luino line. Following the testing they were assigned to Lausanne depot, a daily mileage of 534km involved one working the route from Lausanne to Lyss and Solothurn. The second motor coach was held in reserve. The evaluation of the two vehicles after three operational years was not encouraging, such that by the mid 1940's both cars were often out of service for great lengths of time. Thus in 1945 the authorities were not in a hurry to return the two 'Red Arrows' to service. They remained in Lausanne but for a short while in the autumn of 1945 one handled a daily pair of passenger trains between Payerne & Freiburg, a round trip of 132km. After the electrification of this route from May 4th 1947 they were used on the Nyon and Divonne service. The success of the electrically powered 'Red Arrows' led to the decision to convert the two diesel powered 'Red Arrows' to electric propulsion, this was completed by HW Zurich in 1951/53. They were reclassified RCe and renumbered 611 in 1951 and 612 in 1953. The gearbox was left in place, meaning the electric motor could not be used at full power, requiring the gearbox's fourth gear to be used when the railcar ventured into the mountains. Normally only the highest gear - fifth - was used. The reverse gear was also left in place and continued to plague the drivers. The cars were dismantled in 1964. Photograph courtesy SLM CLm 2/4 101 is seen on its first test run early in 1936 near Romanshorn. The Appenzell Railway is located in a mountainous district in the north east of Switzerland, connecting Appenzell with Herisau & Gossau. Seating: about 40 2nd & 3rd class + additional folding seats. These were the first narrow gauge diesel powered vehicles to run in Switzerland. 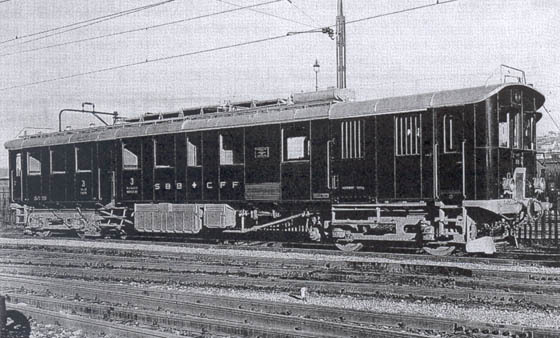 The railcars were designed to haul three trailers in regular service on the mountain grades, on the downhill runs the braking equipment was sufficient to handle eight trailers. The car body was provided by Societe Industrielle Suisse, Neuhausen & the electrical equipment from Ateliers de Construction, Oerlikon. The car body was oak framed with a metal covering, steel at the motor bogie end and aluminium at the diesel engine end, a novel way to save weight and keep the axleloading under nine tons. The trial run of the railcar took place on April 2nd 1929. The weather was indifferent, four inches of fresh snow were on the ground and a strong east wind was blowing, increasing the uphill resistance of the train. 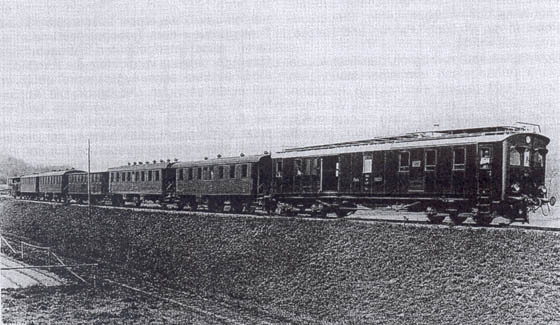 For the trial run the railcar was coupled to three coaches for a total weight of 68 tons. The line is 16.25 miles in length running from Gossau to Appenzell, rising 870 feet with many curves, the maximum gradient being 1 in 27. The test run ran to the steam timetable permitting only a maximum speed of about 22mph. When both railcars were placed in service they were able to handle about 75% of the timetabled services. As well as a considerable saving in fuel costs the preparation time for the railcars was about ten minutes as compared to two hours for the steam locomotives. The better availability of the diesel railcars allowed for an increase in services, capturing extra traffic from a competing line. An early view of railcar 25 (later renumbered 55) possibly under test at Waldstatt. The bogie nearest the camera carried the two self ventilated, nose suspended, four-pole motors, using a reduction gear of 1:4.12 to deliver the power to the axles. The axle loading on the motor bogie is 8.7tons (loaded) & 7.8 tons (empty), for the unpowered bogie 8.8 tons & 8.2 tons respectively..
Appenzeller Bahn Triebwagen No. 56. The right view shows the end of the railcar containing the Sulzer engine and the non-powered bogie. Information based on several articles translated from German, all errors & omissions are entirely mine. "Die Elektrischen und Dieseltriebfahrzeuge der SBB, Volume 1" by Hans Schneeberger, Minirex, Lucerne 1995. Sulzer Technical Review No.1B of 1933 - special edition for the International Railway Congress 1933. Page added March 25th 2004.